About this time last year I wrote a blog post about road bikes that are specifically built for short women, and ever since my monitoring has shown that this is a really popular topic. So I thought I should update the information for all you shorties. I’m a relatively short woman at 160 cm (5 foot 3 inches) but I’ve met quite a few female road cyclists who are shorter than me and one of them mentioned to me that she and other short stature women have trouble finding bikes to ‘fit’. A lot of people are dubious about the whole women’s specific bike concept and question whether it’s just marketing hype but I’m a real believer in the philosophy. Read my past posts on this subject and make up your own mind. From my perspective the women’s specific bike becomes more important the shorter you are, so women who measure in at 5 foot or below should really consider a women’s specific bike. Thankfully plenty of bike manufacturers have responded to the short end of the market and many produce extra small road bikes. Giant – Giant is also committed to manufacturing bikes for shorter women. Its Envie and Avail models all come in an XS size. Although some of this year’s bikes are pretty garish with bright purple featured a few times! Once you’ve drawn up your own shortlist the hardest part will be finding a bike shop with a 44 cm women’s bike in stock that you can take for a test ride. There is one women’s bike shops in Sydney – Giant Sydney and the nearby Clarence Street Cyclery has a dedicated women’s section, both in Clarence Street in the CBD and they’d be a good place to start if you live in Sydney. You could also keep a look out for ride test days that a number of manufacturers run like Specialized, Trek and Giant. They usually have a range of bikes and sizes for potential buyers to test. 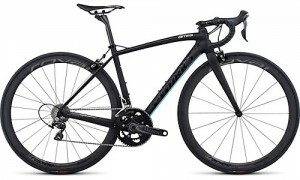 I was concerned a little bit about my height when buying my first road bike- I am 5ft but found a really good bike shop who found the perfect bike for my height. It was a specialized Amira and I absolutely adore it and would recommend to anyone like myself who is of short stature. I’m a big believer in the women’s specific bike too. I’m tal and everyone assumes you’ll be fine on a men’s bike but our body forms are not same as men’s. I’m a big fan of my Speciliazed Dolce. Hi Nicola! I think I was the inspiration for your original blog post about short women and small bikes. I am happy to report that I am now riding a 48cm Specialized Ruby. I LOVE LOVE LOVE HER!